Yet another utterly unrelated post to baking. Ginger beer. I grew up on this stuff, not like the ginger ale here in America but this burningly good ginger extravaganza. We made this baby at school, after we tasted some really good stuff the quarter before us had made which didn't taste boozy at all. However, when we tested the stuff we made, it was incredibly beery...not so good in my book. I want the burn of ginger not of alcohol. The chef in charge said that it was probably because the natural yeast/bacteria in the beer had consumed all the sugar, so there wasn't a heap left. I'm guessing the solution would be to add more sugar. Hopefully the stuff I'm making at home will work our - I still have nearly a week to go before I can try it out, so fingers are a crossed. Thank you Josh for the picts on this one! After much thought, I've come to the decision to forgive you for this greivous offence of posting on such an unrelated topic. Heck, its totally enthralling to listen to your latest endeavors. Who gets to make their own kimchi and ginger beer? Rhid, thats who. Have fun! Hey, I just found your blog--I like it, and you pics are great. 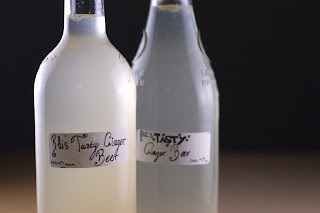 One tip on the ginger beer: it should only take a couple days to carbonate. The beery taste you are getting is over-fermentation. 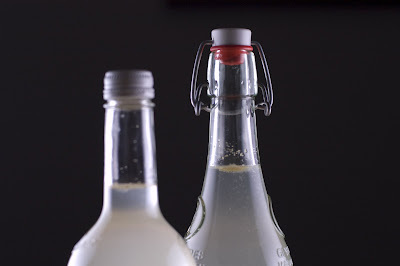 If you use plastic bottles you can just squeeze the bottles once or twice a day till they are totally hard, then put them in the fridge to stop the fermentation. A side benefit of plastic is that you won't ever get any bottle bombs.